We spent a few days on the Caribbean coast a few weeks ago and saw a remarkable transformation. We started up north on Playa Westfalia and there was a crew with a truck full of asphalt, a few guys with shovels, a backhoe and a steamroller out front one morning. Four days later we were at the Korrigan Lodge (highly recommended) across from Playa Cocles. We were nearly at the Panama border, but along came the road crew. 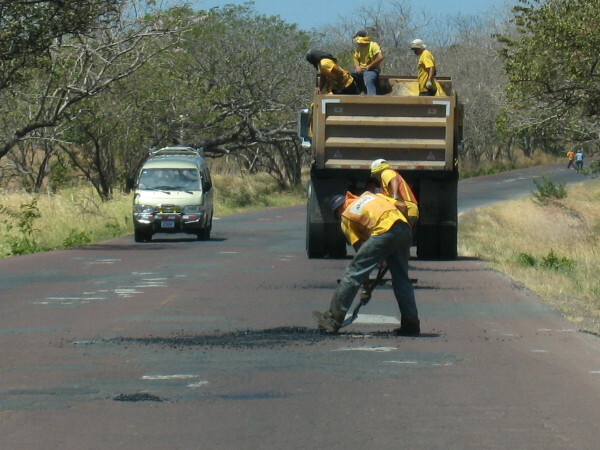 They had patched every pothole on the road between Limón and Manzanillo in under a week. Normally that sort of project would require months. We’d witnessed some sort of world record for Costa Rica hueco repair. Of course this doesn’t happen often (ever?) but there was a reason for the repairs. The president, several government ministers, a handful of prominent businessmen and some French dignitaries were coming to the coast for the weekend finish of the Jacques Vabre trans Atlantic yachting race from Le Havre France to Limón Costa Rica. As we headed north the next morning we saw a news van along side of the road next to the Limón airport and a camera was aimed at a reporter standing in the rain and pointing beyond the runway out to sea. I slowed down and peered in that direction and sure enough there was a little white triangle of a sail on the horizon. Then I looked up as I heard the dull thud of rubber being compressed all the way to the rim and saw muddy spray cover the windshield. The section they had patched earlier in the week was already sprouting new potholes! I smiled to myself as I realized all the roads in Costa Rica were only a MOPT budget cut away from their gloriously holey past (read why we’re nostalgic for Costa Rica potholes).